Click on the images or section titles below for details of Graham Turner's Aviation Prints, Original Paintings, or Cards. While Graham Turner is careful to ensure that Studio 88's prints are of a very high quality, nothing can compare with owning an original, whether it's a large scale oil on canvas or a smaller gouache painting. These are one-offs, painstakingly researched and created over many days, weeks or months. 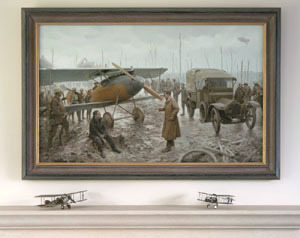 Click on image or title to view currently available original aviation paintings by Graham Turner. 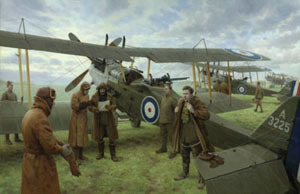 A selection of high quality giclée prints reproduced from Graham Turner's award winning paintings of First World War aviators. Available in a selection of sizes, on paper or canvas, each print is individually printed and signed by the artist, ensuring a result that is as close to the original as possible. Click on image or title to view currently available Aviation Giclée Prints by Graham Turner.